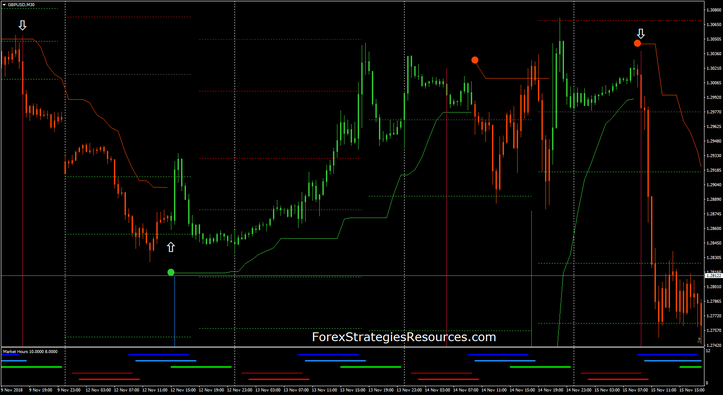 ATR Stops with Magic Fx is a trend following strategy based on two indicators: ATR Stops and Magic Fx. The purpose of this strategy is to find on good filter for Magic FX that I belive on good indicator for entry in the market. The solution to this question was to use the atr stops and reverse for its main feature to follow the trend of the market price well. Time Frame 5 min or higher with different setting. Trading sessions for 5 min time frame 9:00 GMT – 20:00 GMT. Time frame 15 min – Triple Exponential moving average - ATR period 10. Time frame 30-60 min – Triple Exponential moving average - ATR period 10. Time frame 60 min – Triple Exponential moving average - ATR period 10. Best time frame 60 min. Market hours for 5 min time frame only London session. 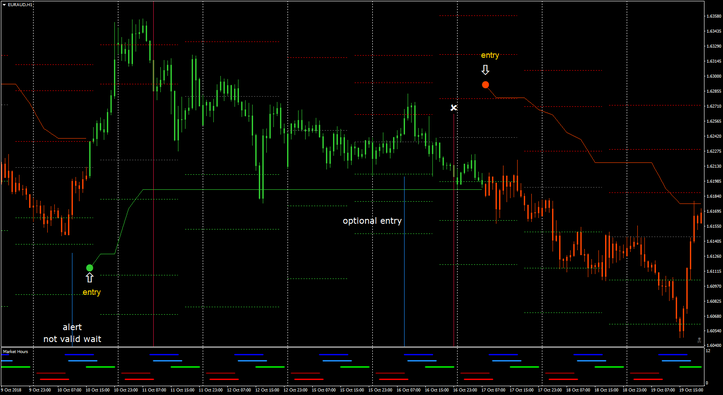 Exit position at opposite signal or at the pivot level. 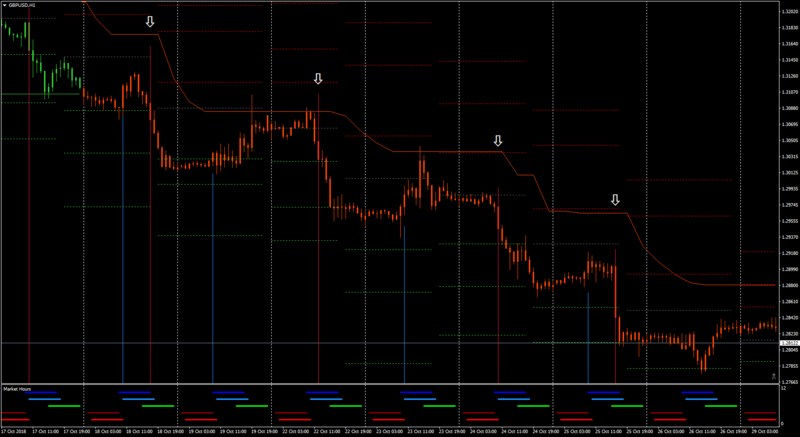 Stop loss 2 pips below line ATR Stops. Optional entry: signal Buy blue line but ATR red. entry when appears the green dot of the ATR..
Stop loss 2 pips above line ATR Stops. Optional entry: signal Sell red line but ATR green line . entry when appears the red dot of the ATR. Note: at 5 min time frame you can use only ATR Stops with 15 min setting. In the pictures ATR Stops with Magic Fx in action. 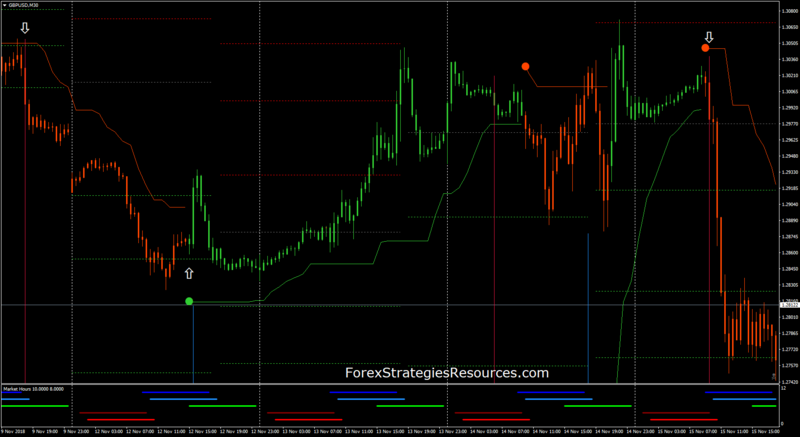 an indicator that is based on the ATR trailing stop. Correct money management and risk is an extremely important factor in the success of using this system.